Ted’s Montana Grill, I asked myself why? I remember when Ted’s opened in the Town Center years ago. There was quite a buzz, about Ted Turner putting a restaurant in Jacksonville and everyone was happy to try the food. We did that several times and then we moved on not caring for the chain concept. 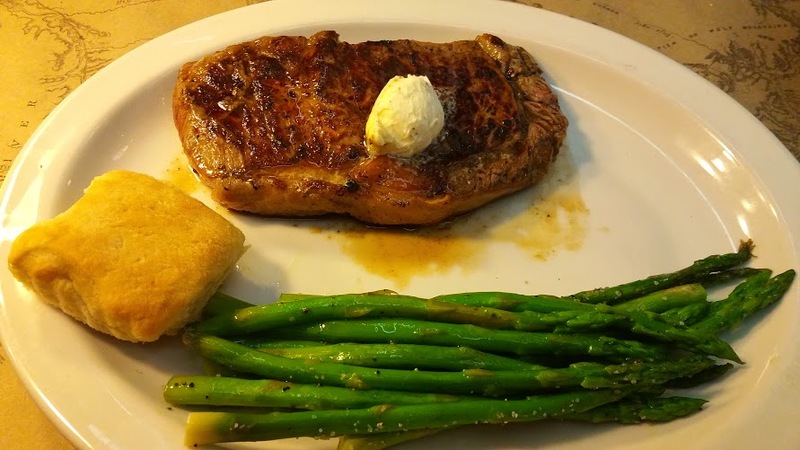 Diners here do love their “chains”, from fast food to well Ted’s Montana Grill people have a tendency to flock to the mediocre and are quite content to do so even though there are more imaginative spots around that offer dishes not found on many menus. I think that’s how we found ourselves at Ted’s for lunch. Most of the high-end steak/chop houses open for dinner and we were thinking something big and beefy or bisony for lunch. We kicked around the usual names and decided Ted’s might be most likely to please. The spot was quite busy for a Monday lunch, which is always good to see, we were seated promptly given our menus and told the usual, “server will be with you shortly”, and sure enough she was. I have to say this may have been one of the better service experiences I’ve had in a while. I regret not remembering her name, cause I would certainly give her a shout out here. Well groomed, lively, funny, attentive, knowledgeable, efficient, I could go on with the positive adjectives but you get the picture. Actually she may have been the high point in the entire visit. We chatted about the menu options then started with what we always start with, a few cocktails. I remembered I had sampled a few Lemon Drop Martinis in the past and thought I would repeat the experience, my friend a Sangria drinker choose the red. 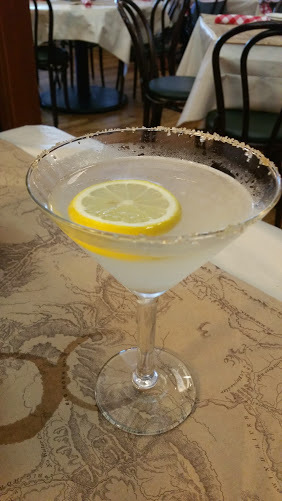 The Lemon Drop was as good as my memory, tart, sweet all at the same time. 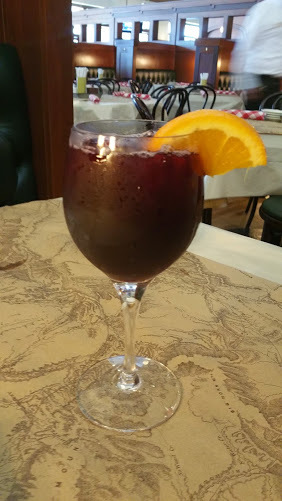 Sadly the Sangria was flat, one lone orange slice attached itself to the rim of the glass….. It was sad. My friend chose a nice Cabernet for the next drink. 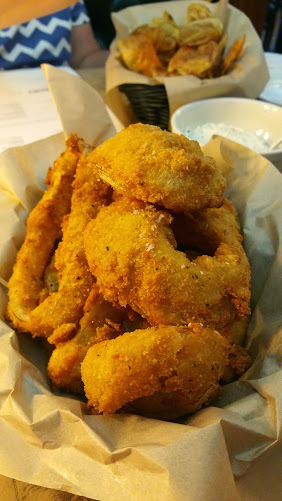 We started with the hand battered onion rings, and an order of the fresh sliced potato chips. Both of these dishes were wins. I find good onion rings are vanishing from menus everywhere to be replaced with a most disgusting perfect circle of thick batter and almost no onion. Not the case here. big beautifu. brown, and sweet soft onions inside Served with a side of a spicy horseradish dipping sauce. 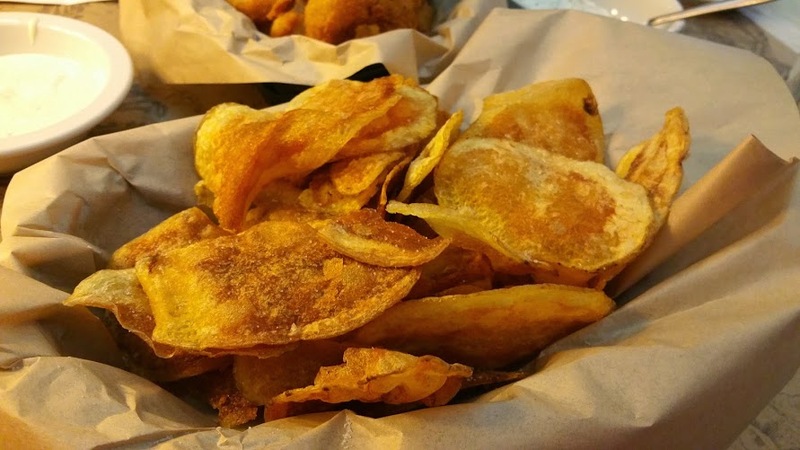 Same for the chips, brown, crispy, salty ,and accompanied with what appeared to be ranch dip. I do believe the enchantment ended there. My friend chose the Beef Rib Eye, me the bison New Mexico Burger. When the plates arrived I noticed the steak looked somewhat flaccid, slightly grey and the little fat around the edges was just melted no crispness seen. Very unappealing to the eye.. It was accompanied by a satisfying portion of nicely cooked asparagus, and a lone role. The meat was cooked to the desired doneness, but just lacked eye appeal. 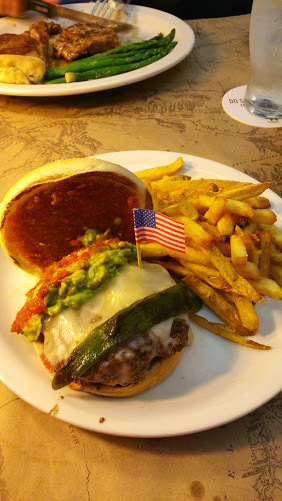 The burger looked amazing when it arrived, there was a combination of pepper jack, roasted Anaheim peppers, spicy tomato jam and guacamole. This was a picture worthy dish, first bite killed it. Although the burger was cooked to well done ( request was med/rare) it was almost cold. I guess the combo tomato jam and guacamole cooled it down. By this time I was so disinterested in the meal I asked for it to be taken away. My friend took her left over home to her dog. We decided not to risk desert. We rated this experience as a meh; (indifference; to be used when one simply does not care.). I know in my heart there are better burgers to be had, and next time we get a craving for a big, fat juicy rib eye we will hang out until the dinner hour when the selection is a little broader .